This is an 'Open themed' non-competitive informal critique, designed to provide honest and supportive feedback - in a friendly and light-hearted way. There is a maximum entry of 2 Digital images and/or 2 Prints per member. 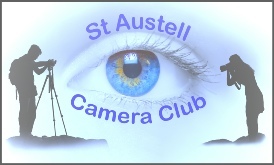 All entries must be new images to the club and cannot have been shown before in any other competition. Club members decide (with a majority show of hands) whether each entry warrants a Silver and/or Gold award. Members are then invited to (constructively) critique the positives and/or negatives of the image. After the vote each images will be critiqued (in a friendly manner) by the members. The author must be present on the night in order to enter. This competition has no defined theme or subject (unless stated otherwise). Any variety of subject matter is acceptable. There is no restriction on digital manipulation or enhancement. For this competition, the focus is on the principle of extreme magnification in capturing items or elements not normally viewed. The subject of the image can be animal, vegetable, mineral, man-made…basically anything that lends itself to close-up photography. Both detailed and accurate representation of a subject and creative interpretation and impression through selective focus is acceptable. The terms 'close-up' and 'macro' are often used to describe the same type of magnification of an image. However technically speaking, a 'close-up' is an image with a reproduction ratio ranging from 1:10 to just below life size. Whereas 'macro' is life size (1:1) to 10:1 life size. For this competition, you can use a dedicated macro prime lens, zoom lens, or a regular lens using a diopter, extension tubes, bellows, close up filters, lens extender or reverse lens. A combination of these devices is also permitted. It is up to the author to choose how they produce the image. You are free to edit your image anyway you want. Colour, black & white, or monochrome images are permitted. A Monochrome can only have one colour, or tonal range, present within the image. This range may include, for example, a variety of shades of grey from very dark grey (black) to very clear grey (white); or any other colour as long as it is within the same range, but not shades of black and another colour. Any image modified by either partial toning or by the addition of another colour to a monochrome, will be deemed a colour image (polychrome), and therefore will not be accepted into the competition. The Natural History competition rules are deliberately strict, because each entry should represent an honest and truthful record of the world we live in. Natural history photography encompasses all branches of natural history (such as flora and fauna, geology and meteorology) with the exception of any human aspects (such as anthropology and archaeology). All subjects should be wild and free with minimal evidence of human interference or man-made objects. Images should illustrate the natural world in a truthful and honest way with no manipulation or alterations, digital or otherwise. Images must conform to the definition of natural history set out by the FIAP (International Federation of Photographic Art), which is shown below. Any image deemed to be at odds with this definition may be rejected by the Committee or the Competition Judge; their decision is final. The Processing of images should be limited to cropping, adjusting levels and minimal sharpening. Although the removal of dust marks is permitted, the removal or addition of any other element is not. Images should be accurately titled with the subject's common and/or scientific name (where applicable and where known). Try to avoid whimsical titling. There should be no feeling that images of exotic wildlife stand a better chance of winning - this is not the case! All well-taken images (composition, exposure, focus, etc) that are faithful to the definition stand an equal chance - regardless of subject. Subjects such as wild flowers, insects, birds, natural patterns in sand or rock, and even landscapes, seascapes and sky-scapes (provided they portray a strong natural history bias) are all acceptable. However, all should be in their natural environment and be wild and free (i.e. find their own food and shelter, and have no contact with humans). No pets, zoo animals, farm livestock, horses, etc please. Definition by the FIAP (International Federation of Photographic Art), and adopted by the PAGB (Photographic Alliance of Great Britain). This competition promotes the manipulation of photographs to create a fictional, conceptual image or photographic art, ie a "Creative Image". Primarily, a "Creative Image" is noticeably different from an image as viewed through the camera lens. The submitted image or images must have been taken by the author. This includes composite images formed by combining multiple images and elements to produce a final image. All components of the final image must have been photographed by the participant. Manipulation can be in-camera using any built in modes. Other in camera creative procedures may also be utilised, such as intentional camera movement, zoom effects, long exposure, multiple exposures, bespoke techniques using lens modifiers or any technique for the image exposure. The creative image can also be formed from any manner of post-processing. Images that are created totally electronically with no photographic origin are prohibited. No clip art or images downloaded from the web are acceptable. All images must be taken by the author. The subject matter is open - abstract, landscape, low light, macro, nature, portrait, still-life, street, wildlife, etc." This is an 'Open Competition' with entry restrictions. To enable every member to enter this competition, the first image in each section (Print and Digital) does not have to have been placed in any other competition. It can be any image of your choosing and may be completely new to the Club. The second image within each section (Print and Digital) must have been placed and won an award (1st, 2nd or 3rd Place, a Highly Commended, Commended or a Silver and Gold Award) in an eligible competition. An image does not have to be entered in to the same category (Print and Digital) that it may have been placed. Other than the entry restriction normal competition rules apply. PRESIDENT'S COMPETITION - Lucky? Unlucky? Digital Images only - no prints! It is completely open to your own interpretation. The image must be less the 2 years old. I am looking forward to your images and hope you have lots of fun during the season gathering them together. You can present images however you choose but it must encompass the theme and meet the club sizing rules of 1200 pixels high maximum for portrait format and 1600 pixels x 1200 pixels maximum for landscape format. Scoring will have a maximum limit of 15 Points. The following categories will be used for judging. Points awarded for this competition are for selection purposes only and therefore do not count towards “Image of The Year” and/or “Photographer of the Year” competitions. Competition theme decided by current Club President. This is an “Open themed” semi-competitive fun competition, designed to produce a light hearted jovial Club atmosphere. Two images (which should not be from the same member) will be displayed at the same time and the members are asked to vote for which, out of the two, they prefer. The preferred image goes through to the next round. This process continues until there only the placed images (1st, 2nd, 3rd, & 2 Highly Commended) remain. There is a maximum entry of 3 Prints and/or 3 Digital per member. Images do not have to be new to the club, but must not have been previously placed (1st, 2nd, 3rd and Highly Commended, Silver or Gold) in any other competition. Points are not awarded for this competition; therefore it does not count towards 'Image Of The Year' or ‘Photographer Of The Year' competitions. This is an “Open Competition” with a maximum entry of three A4 (or smaller) colour or monochrome un-mounted prints. To be judged by the members on the night. This one is just a bit of friendly fun for the last night of the season. *Please contact any committee member if you require any advice or guidance regarding the Club competitions, rules or definitions.